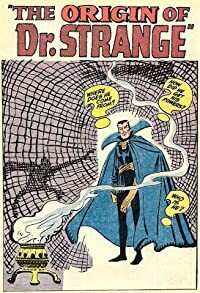 Strange Tales #115 - The origin of Dr Strange. This story begins with a cute note from Stan Lee talking about how they got a flood of letters reminding them that they "forgot" to print an origin for Dr. Strange. So just to be clear; this isn't Dr. Strange's first published appearance, but it is retroactively his first story (so maybe it's the first Continuity Implant?). This is a classic origin story - the arrogant doctor loses the use of his hands in an accident, and after becoming a drifter finds his way to India (in #111 the Ancient One's home was identified as being "somewhere in Tibet") to look for a legendary mystic - referred to for the first time as the Ancient One.